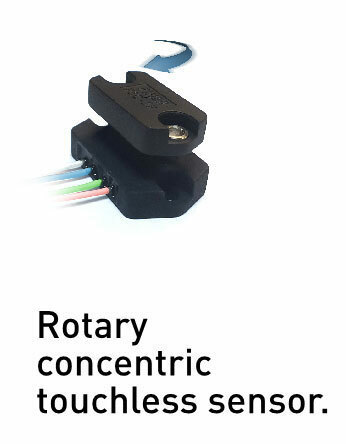 Contactless technology – Potentiometer manufacturer. Fabricante de potenciómetros. This touchless technology is only sensitive to the flux density coplanar with the IC surface. This allows to decode the absolute rotary (angular) position from 0 to 360 degrees. 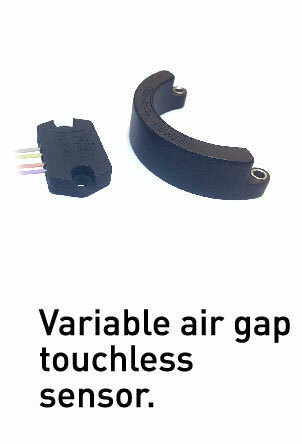 It enables the design of high performance non-contacting magnetic rotary position sensors for both automotive and industrial applications whithout the limitations of potentiometric solutions (wear, electrical angle…). In combination with the appropriate signal processing, the magnetic flux density of a small magnet (diametral magnetization) rotating above the IC can be measured in a non-contacting way. The angular information is computed from both vectorial components of the flux density (i.e. BX and BY). Then an output signal proportional to the decoded angular position is produced. Our sensors do not rely on expensive bearings what affords Piher to offer the best price in the market. The output is selectable between Analog, PWM and Serial Protocol and a configurable switch ouptput is integrated within the sensor. Redundancy is integrated in the circuit too, and furthermore, you can request a dual-chip sensor for true full redundancy which comprises a dual switch output. With truly non-contacting sensing (no gears inside subject to wear), high repeatability, low power consumption and wireless option, these sensors provide an all-in-one integrated and maintenance free solution for harsh environments. 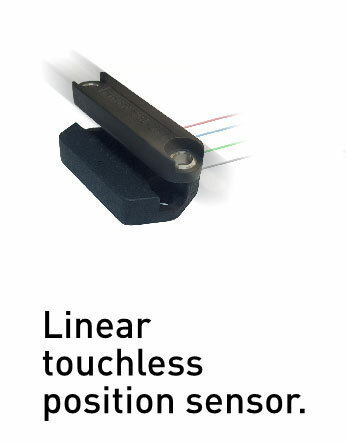 • True Non-contact technology without sliding noise (no sliding electrical contacts). • Standard linearity: ±1% absolute (better upon request). • Simple & robust magnetic design. • Programmable Angular Range up to 360 Degrees (without dead band). • Programmable Linear Transfer Characteristic(some positive slopes & one negative slope can be programmed in the same transfer characteristic; up to 4 programmable points). • Selectable Analog (Ratiometric), PWM, Serial Protocol, CAN SAE J1939. • Up to 14 bit angular resolution. • Rotational life: 50.000.000 cycles (depending on application and mounting). • Operating temperature: -40ºC to +150ºC. • Supply voltage: 5V ±10% (others upon request). • +10V over voltage protection and –10V reverse voltage protection. • Protection class up to IP69K.